WHAT: beach clean up + surf school + surfboard raffle + more! Join us for a beach cleanup + surfing school combo at the beach, behind Nomad Surf shop. We will also be selling raffle tickets to win a Nomad surfboard! Come on out and celebrate International Surfing Day with us! 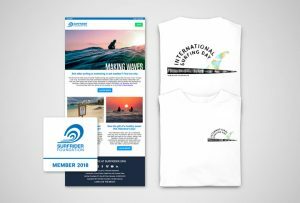 Join, renew or make an additional gift today of $40 and you’ll receive a limited edition 2018 International Surfing Day t-shirt.